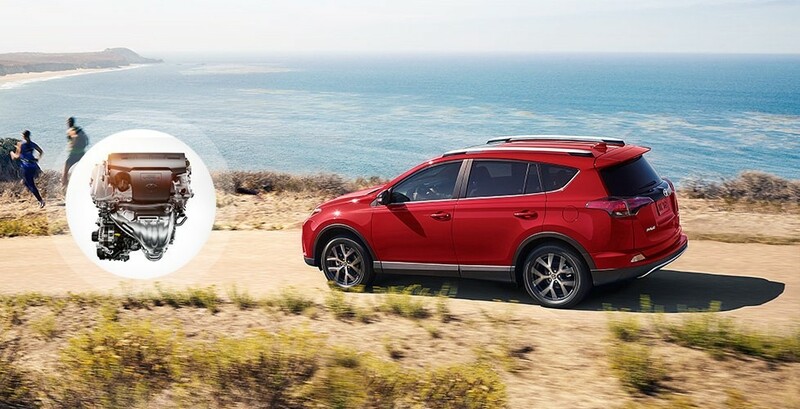 Celebrate your Independence Day in style with a new Toyota RAV4. 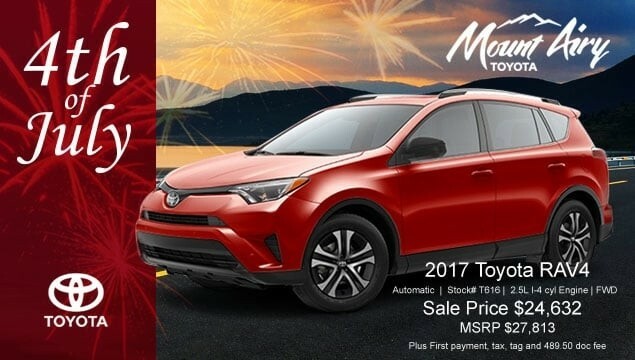 This 4th of July, Mount Airy Toyota is having a big sale on one of our favorite SUVs and we want to find the one that fits you. Why the RAV4? Well, it is one of America’s bestselling SUVs. And, this year it is bigger, better, and more fun than ever. Whether you are heading to the mountains, the beach, or staying in town this 4th of July, make the new 2017 Toyota RAV4 your method of transportation. When RAV4s began showing up on the roads in the early 1990s, they were compact and made with little pizazz. But they were made well and you could, and still can, find a Toyota RAV4 clucking along with over 300,000 miles under its belt. Breaks, tires, maybe a timing belt had to be changed, but that’s to be expected. The guts were still intact and operating as they should. Something you just don’t see in many vehicles made today. The 2017 Toyota RAV4 keeps its respected stamina and adds a tougher looking exterior, more comfortable interior, and showcases some impressive performance. Toyota’s RAV4 has only gotten better with time, and this year we find one with a bit more pluck and intuitive design than its predecessors. The RAV4 does something that just about no other compact SUV maker would dare attempt: RAV4 comes with a hybrid version. That’s right, there are two big choices to make before you go through all the features and add-ons. Do you want a hybrid or gas? And the answer to this mostly depends on the level of performance you need. But which one is more powerful? You will be surprised. Let’s begin with the non-hybrid. The 2017 RAV4 comes with a 2.5-liter, inline-4 engine that has up to 176-horsepower. Oh, and it gets great gas mileage. It offers an all-wheel-drive system, which has electric controls that tell the rear wheels when to kick in, so that they are not needlessly running every time you go for a spin. On the road, the RAV4 is as smooth as ever and fun to drive. And with the inline-4, you get a little extra boost. The RAV4 hugs sharp turns and scoots in and around town like a pro. Now for the hybrid. Believe it or not, this version actually has more power than the base, gas model. This electric-gas powered machine operates with a 2.5-liter, 4-cylinder engine. And it has up to 194-horsepower! The engine is paired with a Hybrid Synergy Drive System, which helps the vehicle to know when and when not to use gas. 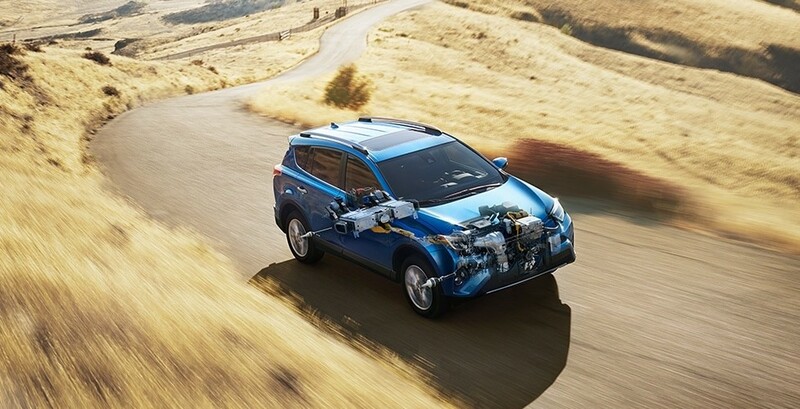 The RAV4 hybrid also comes with all-wheel-drive, and gives the same smooth, sweet ride as its gas-only counterpart. In terms of safety, Toyota has made many improvements in the 2017 Mount Airy Toyota RAV4. And not that they were bad before. RAV4s have always scored high in this department, but the newest version seems to get it perfect. The 2017 model has what Toyota calls, “Toyota Safety Systems.” This combination of safety mechanisms makes the RAV4’s safety ratings soar with forward collision warning, automatic emergency braking (just in case your foot can’t make it to the brake pedal in time), lane-departure alert, adaptive cruise control, automatic high beams, and pedestrian pre-collision. Not bad, huh? And there are plenty more. You don’t have to take our word for it. The Insurance Institute for Highway Safety (IIHS) gave the 2017 RAV4 its highest safety scores, plus Top Safety Pick for this year. 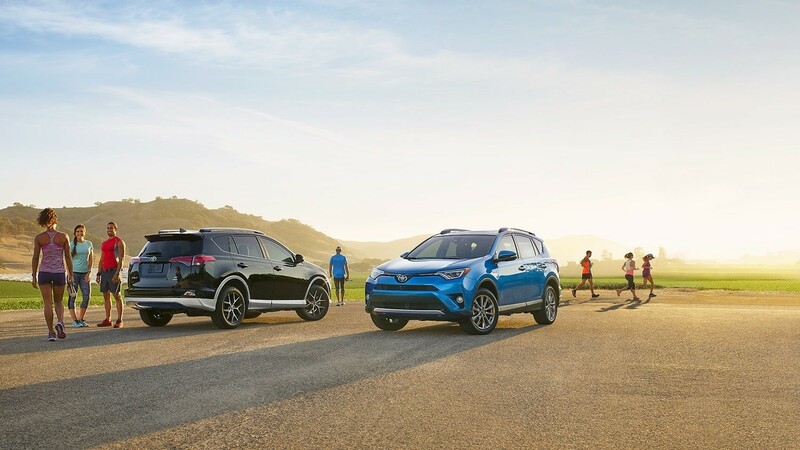 The National Highway Traffic Safety Administration also gave the compact SUV high ratings, further proving the RAV4 to be a stalwart leader in a continually growing family of crossover vehicles. The 2017 RAV4’s line of safety features include a total of eight airbags, a rearview camera, a surround-view camera, plus the impressive safety systems previously mentioned. And what better peace of mind to have this 4th of July than knowing you are driving around with some of the most high-tech safety features made. RAV4s, even the old ones, have never lacked in the area of comfort. And this year it just gets better. At the new Platinum trim level you can now opt for all the usual upgrades, plus a heated steering wheel. You can also get Toyota’s SofTex upholstery, which has the look and feel of leather but comes at a fraction of the cost. But no matter which trim level of RAV4 you choose, you will be comfortable. The driver’s seat sits perfectly upright, but still manages to cradle and keep you comfy. You have a perfect view of the road, everything is at arms length, yet somehow you feel as though you are somewhat reclining. It’s nice. Really nice. All entryways and exits are easily accessible, and it offers plenty of cargo space with a section below the floor, and a liftgate. Whereas the RAV4 of old could truly be considered a small, crossover vehicle, the 2017 model leans more towards the end of medium/large SUV. And this shift greatly helps in way of space and comfort. 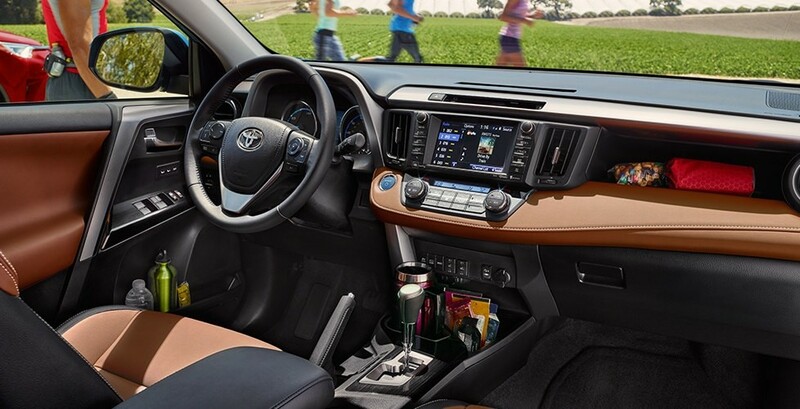 With a smooth, quiet ride, soft interior lighting, and soft-touch materials throughout, you can’t beat the new RAV4. Toyota has turned the RAV4 into one of those vehicles that can come with a seemingly unlimited number of features to add or alter. This is a good thing, as you can end up driving away with something truly tailored to you. But it does take some time to figure out exactly what you want. 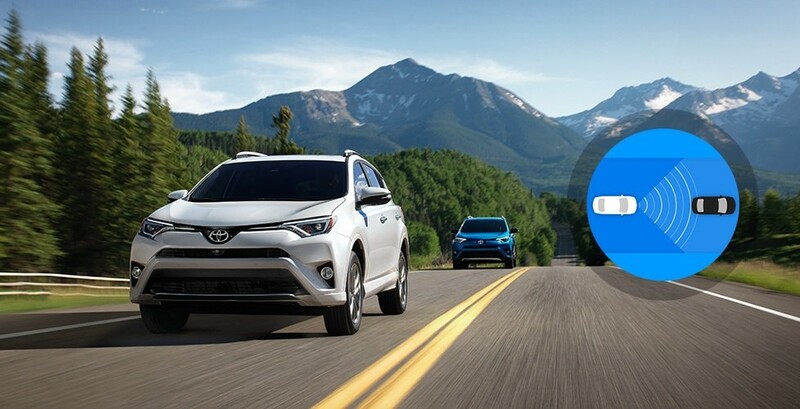 That’s why it’s a great idea to come down to Mount Airy Toyota where we can help you through the process of picking out your perfect RAV4. A Unique Front Bumper and Grille Design. And there are so many more. You can use hands-free calling and texting. Can even use the OpenTable app to make dinner reservations while on the way to the restaurant! The possibilities become endless the more car companies are able to connect our vehicles with our smartphones. And Toyota seems to be one of the carmakers leading the way. One of the greatest things about driving a crossover SUV is that they know how to conserve fuel without losing power in performance. The 2017 RAV4 gets around 23 miles per gallon in the city and 30 mpg on the highway. Not bad at all. Especially with the power this thing has. What this equates to is a family-fun sport utility vehicle that requires less trips to the gas station. And, if you go for the RAV4 hybrid, there is even better fuel economy. Toyota seems to think of it all, performance, safety, comfort, and fuel economy. Those are the big ones for any vehicle, and the RAV4 gets top marks on every one. So why wait any longer? 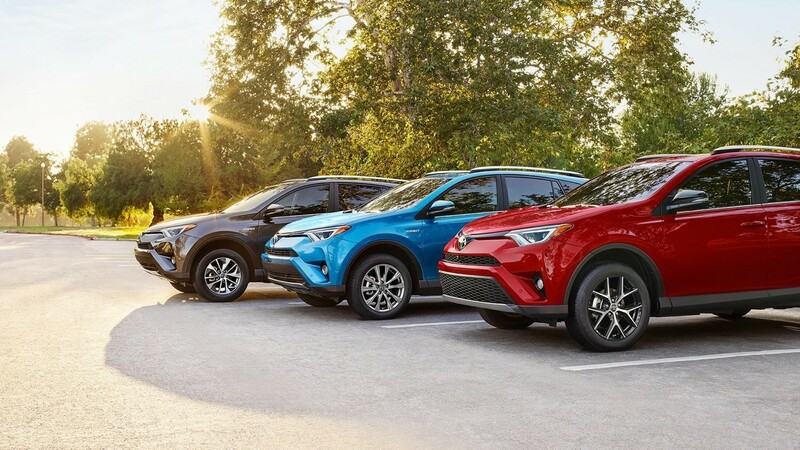 Start deciding on your RAV4 today so you can take it out with friends and family this 4th of July in Mount Airy, NC.